EXCLUSIVE: Now open, your own private lounge at Gatwick from £37.50! 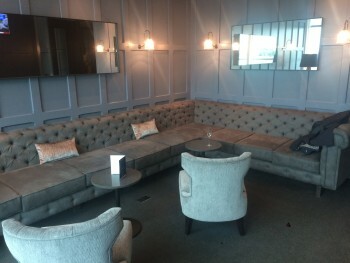 A fascinating new airport lounge option opens at Gatwick South today – Clubrooms. 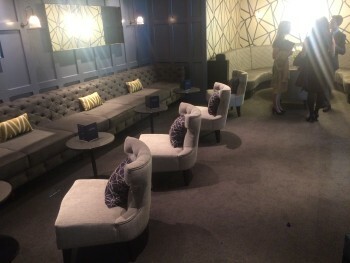 Clubrooms is a new product from No 1 Lounges (part of the No 1 Traveller group) which will be very interesting for business travellers, high end leisure travellers and groups. Clubrooms is a suite of four private airport lounges in the South terminal at London Gatwick. It offers a level of privacy and service which you won’t find at any other UK airport lounge – and the pricing is suprisingly reasonable. I went along yesterday for a preview and was impressed by what I saw. There are two large rooms and two smaller ones. Each has a TV, a soft drinks fridge and fruit. The space can be personalised at advance notice – there are PlayStations available for example. Alcoholic drinks and a wide range of hot and cold food – all included in the price, except for champagne – will be brought to you by the staff. The larger rooms will be mostly used by smaller airlines which currently use the main No 1 Traveller lounge at Gatwick South. This will offer a substantially more premium experience to those passengers, albeit in a smaller space. It will also reduce pressure on the No 1 lounge and make it easier for Priority Pass, Lounge Club etc customers to get in at peak times. The smaller rooms are the most suitable for booking by the general public – ie you! Here is where it gets interesting. The price is £37.50 per person with a minimum of four people. This photo and the one below it are of the room you are most likely to get. Remember that you get exclusive use of the room for three hours. In terms of cost, this is exceptionally reasonable. The ‘advance booking’ rate for the main No 1 Traveller lounge is £20 via the current Avios promotion, increasing to £30 on the door. For a modest premium, a group of four or more would have their own private lounge for up to three hours. If you were hungry, the Clubrooms could work out cheaper than No 1 Traveller, as many of the food items offered for free in Clubrooms are chargeable in the main lounge. Lunch options include Keralan vegetable curry, chicken cacciatore and a range of salads as well as ‘comfort food’ options such as chicken wraps. For a family or group that has paid a few thousand pounds for premium class tickets, or as a gift for a couple heading off on honeymoon, or for a group of business travellers who want some genuine privacy to discuss work before they travel, this is a great product. British Airways, remember, is moving to Gatwick South next November. There is definitely a segment of BA premium passengers who will prefer to pay for a Clubroom than use the new BA lounges – after all, we are only talking about spending possibly 2% – 5% of the cost of Club World long-haul flights. Clubrooms is open from 6am to 8pm daily – note the fairly early closing time. If you are passing through Gatwick South, I’m sure they would be happy to let you take a quick look around – the entrance is next to Dixons Travel on the upper level. More details on Clubrooms can be found on the No 1 Traveller website here. If it sounds interesting for a specific trip, I would enquire sooner rather than later – daily capacity is obviously restricted given that each booking is for three hours. I also have news of changes to the No 1 offering at Gatwick South – more tomorrow. It was full at 5pm yesterday when I was taken in. However, some airline contract passengers will be using Clubrooms from today which may remove some bottlenecks. Apparently they get 800 per day in South as opposed to the 200 it was designed for ….. Thanks for the feedback. 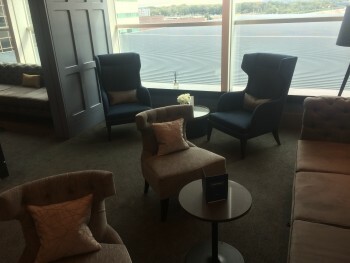 I regularly use the Plaza Premium lounges at LHR T2 and various Arlanda lounges. I’ve never had a problem getting entry to these so I currently have a good impression of Priority Pass compared to some others (although I do miss United Club). Slightly typo I think as I am Not sure how a couple going on honeymoon could book a club room if the minimum number of people required to book a room is four! For parties of four people or less, you can hire a private room with food and drink table service from £150 per room. No minimum. Pay your £150 and it is yours for up to 4 passengers. Forgot to ask how they charge for children. Maybe ‘snug’? But the range of rooms is more extensive than that & I often see them exclusively booked for small groups. Worth enquiring if you are using T3 & have that need as per the article. Don’t most No1s have something similar? Any more details on this? the website says ”Dining & drinks packages” no mention of whats actually included. It’s unlimited food & drink (not Champagne). [email protected] ACTUALLY A GREAT DEAL< AS IF YOU Check the menu there are loads of normally chargeable rather tasty-sounding items! …that is, assuming they haven’t changed the food offering! On the dropdown menu here you’ll see the food menu, ordinary lounge visitors get 1 item free. There used to be a much more extensive food menu on an a la carte basis, which I can’t see online. I hope they haven’t dropped it. So not quite so good. The bistro items are £4 each after your free one, so you do the maths. All of the food is free – you get a menu and the staff will bring as much as you want. Mainly ‘comfort food’ items, both hot and cold. There is a range of soft drinks, beer, wines, spirits and prosecco. I don’t have the menu with me at the moment. The drink ‘level’ is Johnnie Walker Black rather than JW Blue so not ‘premium’ to that extent – but neither are you getting Gordons Gin (I think it was Bombay Sapphire they had). I think Moet & Chandon was £20 a bottle (TBC) and the champagne prices go up further – they have a range of brands. Champange is the only drink which requires payment. When BA moves over to Gatwick South next year I will try to get a package as a competition prize – they were happy in principle with the idea yesterday. “All of the food is free”… I far prefer the description ‘inclusive’, because it’s not really free! Ah yes, back to the HI Express lawsuit! I have a Lounge Club card with 2 complimentary passes from the Preferred Gold Card. Do I need to keep the Gold card active to use the Lounge Club card. Was hoping to refer my husband and cancel this card but want to use the passes for a trip in Dec. I suspect the Gold card needs to be active. Can anyone confirm this. Thanks. As soon as Gold card cancelled you lose lounge card. So do I just pitch up at a lounge and they let us both in please? This looks amazing value for money and a really nice way to kick off a holiday/trip in style! With wine at c. £8 a glass in the bars etc. you don’t need more than a couple and a bite to eat to be ‘in the money’. Just to add a data point – I’m flying IB Express LGW-MAD and was redirected to the Clubrooms. Was nice being able to order a main and a salad to go with and not need to stump up any extra cash. I’m flying J so not sure if it would be the same deal for a OWS/OWE card holder flying in economy? That’s a result, almost worth flying IB via LGW to get this. The food on the LGW-MAD trip was also very good. BA could learn a thing or two…….. will e-mail you a pic!